While it may be easy to imagine how iPads can support classroom studies with reading, history, or science, some of the most groundbreaking -- and creative -- work with digital tools may be happening in arts classes. Schools using iPads are incorporating them in art and music classes, too -- and not only as tools for measuring and remembering, but for creating as well. Whether or not students grow up to become the next David Hockney - who has created several New Yorker covers using the iPad’s drawing tool - teachers say there is value to learning to create using digital tools, especially when blended with more hands-on means of expression. Susan Sonnemaker, a middle school chorus and band teacher at San Francisco Day School, uses school-provided tablets in limited amounts throughout the year. She finds them most useful for managing technical aspects of music class with record speed -- like recording practice sessions, using a tuner app to help kids tune their own instruments, and collecting digital practice sheets. For practical matters, Sonnemaker says, the iPad has been invaluable, because streamlining and managing tuning and practice leaves more time for actually playing or singing music. Benefield’s colleague, visual art teacher Karen Richards, notes that iPad apps have made the tools that digital artists use much more accessible for young children, but having the digital technology available doesn’t at all diminish hands-on art making. “I must stress that technology is one of many tools our students have to execute their critical and creative thinking. We believe that they must also know how to sew, woodwork, sculpt in clay, paint, draw, make prints, shoot a good photo, animate an image, and know about the artists that they stand on the shoulders of,” Richards said. Richards describes a recent photography-based project she developed in order for children to blend the two: “They're all taking tons of photos (with the iPads), so we worked on photography. We also learned a bit about Photoshop with Photoshop Express, and we had each student (K-8) edit and alter their photo before printing it out on watercolor paper," she said. The final outcome was a sewing project inspired by textile artist and San Francisco Day School artist-in-residence Ehren Reed, where the students sewed into their photos. While work like Miller’s is decidedly un-tech, his painstaking efforts to stay analog highlight the tension between handmade and digital art - about what it means to be creative, and what constitutes art. In this way, can digital art become a catalyst for students, an opportunity for them to ask, what is the best means of creating my message? Miller teaches Art and Media Communications for the pilot program, and while her school doesn’t provide an iPad for each student, the course is designed to bring fine arts and digital literacy together. She describes the curriculum as aiming to be relevant to students' lives through the use of technology, while also helping to foster collaboration and divergent thinking. In order to get students to focus on divergent thinking, she shows them Sir Ken Robinson’s famous Changing Education Paradigms video on the first day of school. The biggest influence of technology on students, Miller said, is the amount of "visual culture" in their artwork. “Because of the prevalence of popular cultural imagery everywhere, those characters (Sponge Bob, Anonymous, Pokemon) are the first images that show up in many of their art pieces. Their brains have been so saturated with this imagery, they are often unable to come up with a unique image or character of their own,” she said. Finding - or creating - the original idea in a massive sea of ever-present information, images and text might prove difficult when it comes to art created using online and social networks on devices that can fit in a backpack or pocket -- there is, simply, so much input. But Susan Sonnemaker said she doesn’t really see that happening in her music class. All the teachers interviewed agreed that art made with the body using sensory, physical materials, is beyond valuable to understanding the artistic process, and should never be replaced (one Broadway dancer who teaches children’s dance emphasized, “Hands-on first, technology later.”). But all the same teachers also saw value in using the digital to enhance and even alter the act of creation. 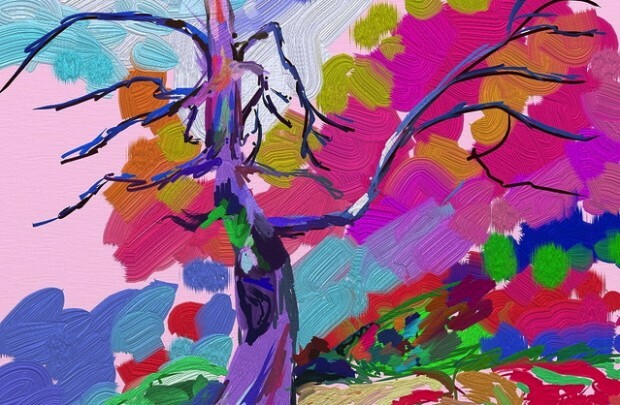 Where will iPad art take us? And what will we leave behind? Only the young artists will know for sure.